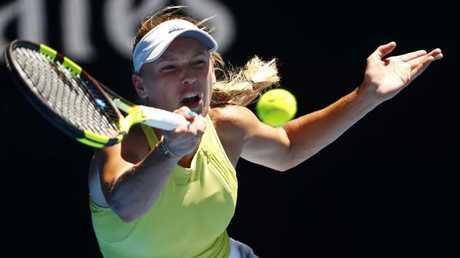 TENNIS: Caroline Wozniacki survived two match points to pull off a miraculous Australian Open comeback and keep her hopes of breaking a grand slam duck alive. The world No.3 and tournament second seed looked done when she had her serve broken twice in the third set to little-known Croatian Jana Fett. Ranked 103 in the world, Fett looked certain to cause another Australian Open boilover when she raced to a 5-1 lead in the final set, and was 40-15 serving for the match. But Wozniacki dug deep, first saving the match points and then charging back into the contest. She reeled of the last six games to escape with a 3-6 6-2 7-5 win in a match lasting 2hr 14mins on Rod Laver Arena to book her place in the third round, against either Dutchwoman Kiki Bertens or American Nicole Gibbs. 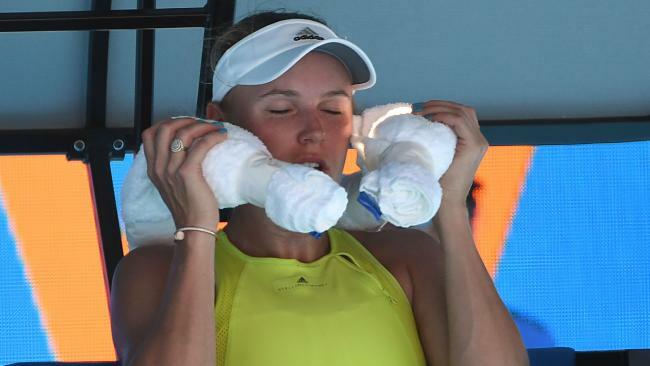 Wozniacki said she was "relieved" to avoid an early exit from the first grand slam of the year. "That was crazy. I don't know how I got back into the match," Wozniacki said. "I've never played her before. She's a tricky opponent. She had nothing to lose." Fett twice faltered when serving for the match and a place in a grand slam third round for the first time after Wozniacki fell foul of the chair umpire for a second time early in the third set. Wozniacki was fuming after having a point contentiously replayed before dropping serve to hand Fett a break and a 2-1 lead. "Oh, so you're giving her the benefit of the doubt, but you're not giving it to me?" she asked British official Richard Haigh before dumping a volley into the net, then thrashing her racquet into the court in disgust after dropping serve. The incident came after Haigh denied the former world No.1 a challenge for taking too long during her second-set fightback, much to Wozniacki's disgust. "What are you talking about? I'm hitting two hands on the backhand. What do you want me to do? 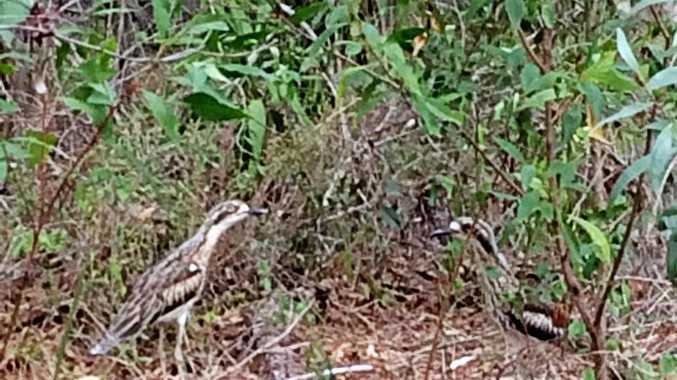 Like, hit it one hand and shout," she quizzed Haigh. But the steadfast official was having none of it. "You need to be faster. You can't wait until that one bounces and then say challenge. I told you at the pre-match meeting to use your voice and not just lift your arm," he fired back. "You waited to see the result of your shot then you said challenge." Wozniacki retained her composure to win the second set and level the match, but it wasn't long before she came under the gun again as Fett threatened to pull off what would have been the boilover of the Open.